I would have expected about 40 ohms..
Is there a reasonably comprehensive list of the CAN 'active' query codes? I'm talking about the parameters for request codes like 797 and 745. I read through the google docs spreadsheet of CAN codes and have gotten through half of the 44 (ouch!) pages of the main CAN bus topic in the forum and have found only a dribbling of these codes (about 7 so far). I'm not sure of the exact terminology for these: polling codes, request/response codes, PIDs (Parameter IDs). So not knowing the official terminology I'm not sure exactly what to search for. I am planning on using a complete leaf pack in a home energy recovery system, still utilising the original bms etc... I am looking at a microcontroller to extract cell voltages, pack voltage and temps exactly as you have done with your code and visual display. I intend to use leafspy as a display but I need a controller and code to switch off the charger and discharge relays to protect the battery, all this can be done utilising the eh outputs from a microcontroller and utilising your code. Could you please specify what type of controller you used to talk to the bms and extract all the data, plus could you share the code with me please. I'm not good at programming but I'm sure I could with a few extra lines of code to switch on and off n output to end charge / discharge of cells are high, low or hot. Many thanks, and I lave the way this thread is helping others. You can set up your own account, branch the code, make your edits, compile, and program the device all within your browser. Request to TCU - ?? ?, Response from TCU ??? The car I was testing on is a base 'S' model so there was no TCU for me to find. The next part I looked for was how to request the serial number of the LBC. I don't know for sure, but I suspect this LBC serial number may be the 'battery ID' that the VCM is paired to in order to decide if it is happy or if it is going to throw a P3102 fault code and limit the motor output. So far I've only looked at three different LBCs. Two were USDM LBCs and both had a serial number starting with SM114 followed by 8 more alphanumeric characters. The third was a JDM LBC with a serial number starting with JT112 then 8 more alphanumeric characters. The first 4 bytes I'll skip as it is the same as deal as reading the software version. The 32 33 30 doesn't appear to be part of the serial number and have been the same on all the LBCs I have checked so far. The 53 (S in ASCII) is the first character in the serial number. The rest of the serial number is in the subsequent messages. You just need to keep requesting the next line. The last character in the serial number has been followed by 0x: 20 20 20 20 on the LBCs I have read so far. There is other stuff I've found too, but I haven't put any time into making sense of it yet (I probably wont for a while either as my playing has lead me off in another direction). For anyone interested in taking this further themselves, these three requests to the LBC (one at a time) will read the current battery data stored in the LBC. Here is a new screen I am working on for LeafSpy Pro that displays the version information from each ECU. The battery serial number is also displayed at the top. The combination meter does not have a value so it is displayed as "XXXXX" to keep the alignment. *752 83 772 334e4c304108423430000000000000000000000038202083 3NL0A.B40...........8 . Any idea what the rest are? Turbo3 - Great work on new screen. That's even better than I was hoping for. Thanks very much. caederus - Although these requests are being made over Car-CAN, my current interests lie on EV-CAN which is why I only identified the control modules that are on EV-CAN. However there are a whole lot of other control modules on Car-CAN that and that is what you're seeing. For example 740 is ABS, 743 is the Instrument cluster etc. If you look at Turbo3's post just before yours then you'll see he has listed other modules he has obviously found (16 in total). You'll also notice that Turbo3 mentioned that the instrument cluster (combination meter) doesn't return a valid value which is exactly what your results show for 743/763. I looks like you've found 17 modules though so I wonder what the extra one that you found is that isn't in Turbo3's list. I suspect Turbo3 will know what the extra control module is as soon as he looks at the data you posted. 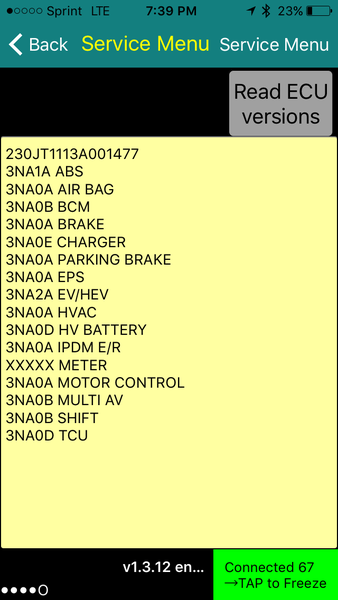 My Leaf is a 2011 model so the list above from it does not include the newer VSP ECU that now has a CAN connection and the AVM ECU (All around view). NocturnalWalt wrote: Although these requests are being made over Car-CAN, my current interests lie on EV-CAN which is why I only identified the control modules that are on EV-CAN. Can you share what you are working on? I'd be happy to capture logs or run tests to help. ...For example 740 is ABS, 743 is the Instrument cluster etc. Without invasively isolating individual modules, how do you work out which is which? ...The next part I looked for was how to request the serial number of the LBC. I don't know for sure, but I suspect this LBC serial number may be the 'battery ID' that the VCM is paired to in order to decide if it is happy or if it is going to throw a P3102 fault code and limit the motor output. So far I've only looked at three different LBCs. Two were USDM LBCs and both had a serial number starting with SM114 followed by 8 more alphanumeric characters. The third was a JDM LBC with a serial number starting with JT112 then 8 more alphanumeric characters.